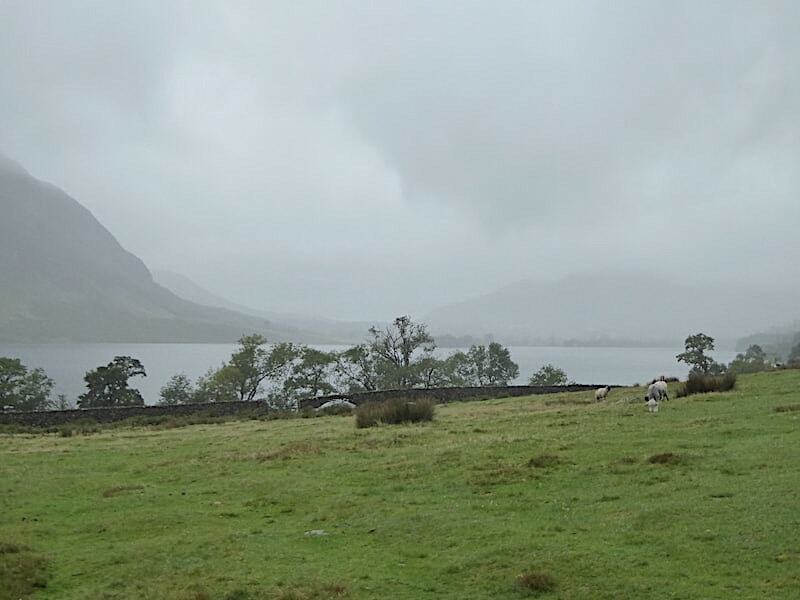 – fortunately they are not fell walkers and were quite content to walk around at ground level despite the rain. 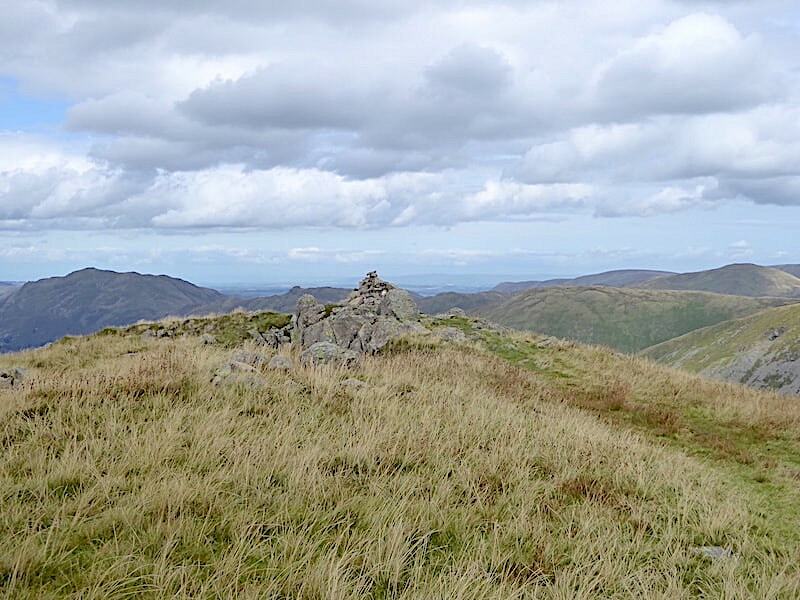 The forecast for today offered dry, calm weather so we decided we’d have a walk up to Red Screes via Caiston Glen, drop down over Middle Dodd and then back to the car. 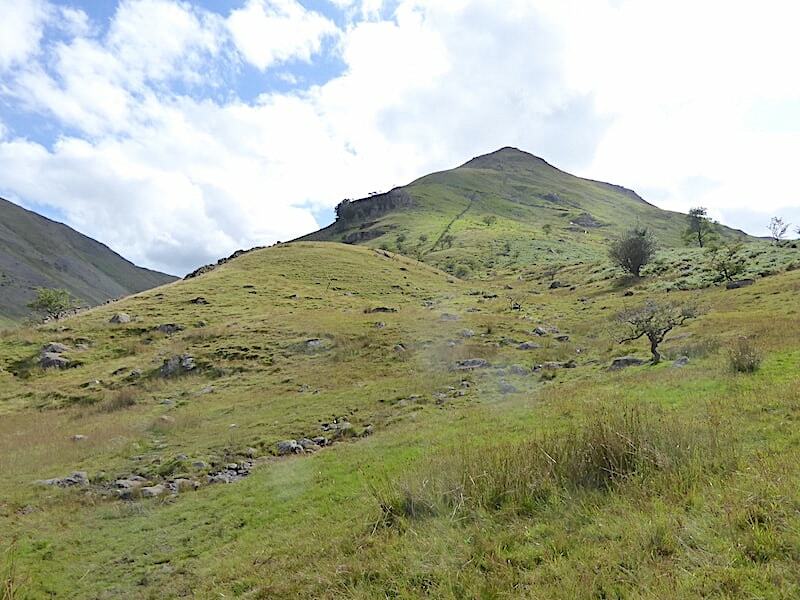 Its not a long walk but there are some quite steep sections so I wasn’t best pleased to wake up with a very sore and tender calf muscle in my right leg. It wasn’t there when I went to bed so I knew right away that I must have had an attack of cramp during the night, although I don’t remember waking up during it. 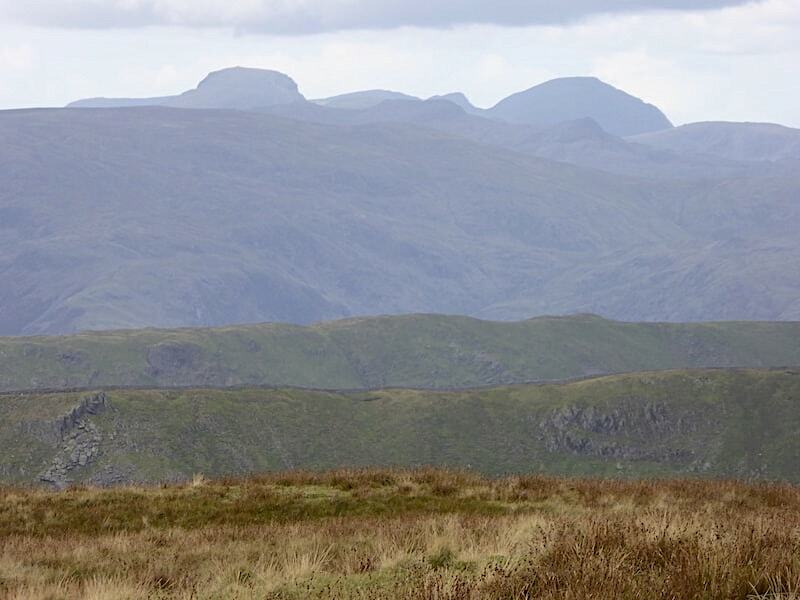 If you’ve ever had a bad muscle cramp you’ll be familiar with how sore the muscle feels once the cramp subsides so it wasn’t the best of starts for a steepish fell walk after almost a three week lay-off. 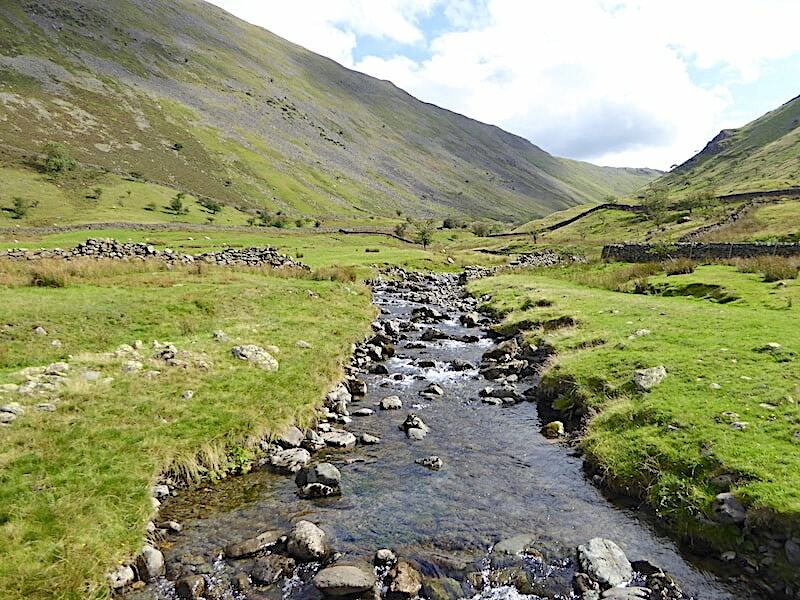 Its not too bad a morning as we leave the lay-by and set off towards the bridge crossing Caiston Beck. 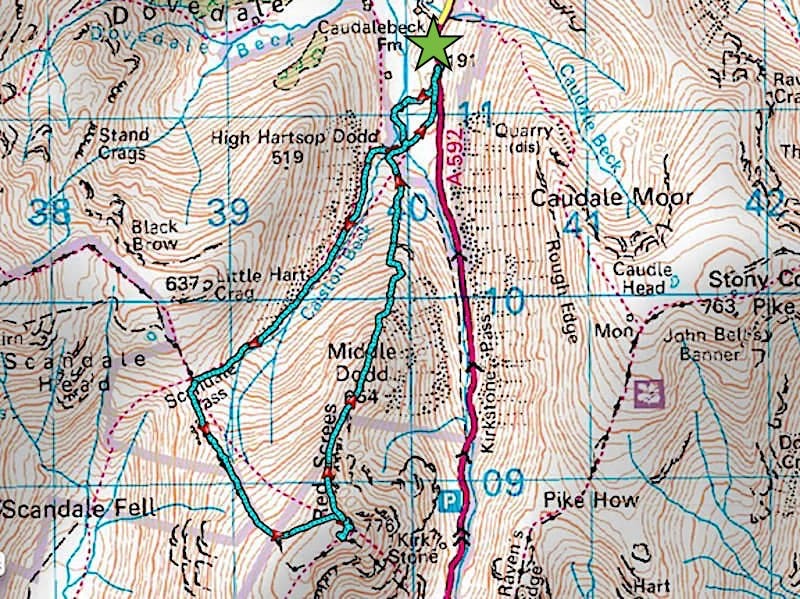 Its cool and cloudy but there is no wind whooshing down the Kirkstone Pass or Caiston Glen to impede our progress. 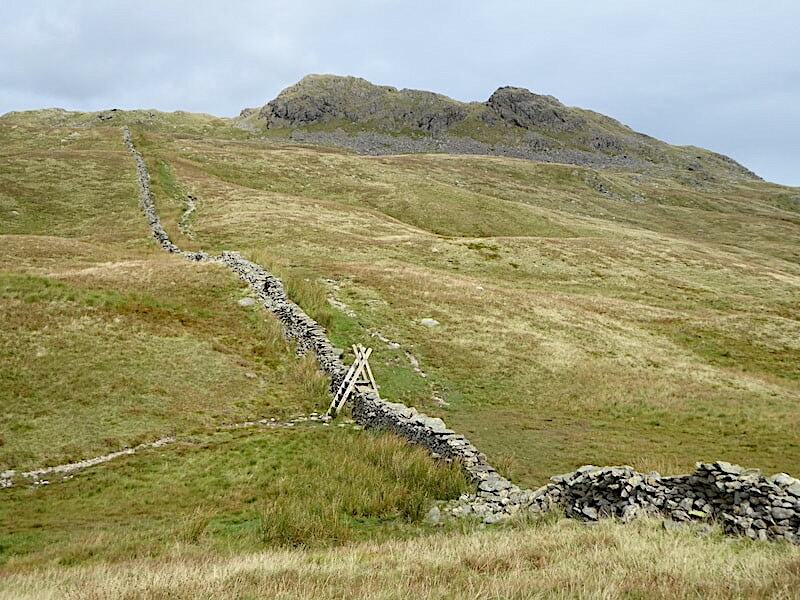 Middle Dodd looms large as we approach the bridge and AW’s pithy comment on climbing it from this direction comes to mind – ‘The direct climb on Middle Dodd is only for pedestrians suffering from a surfeit of energy: they will soon get rid of it on this treadmill.’ Once across the bridge we follow the path across the grass towards a gate in the wall. 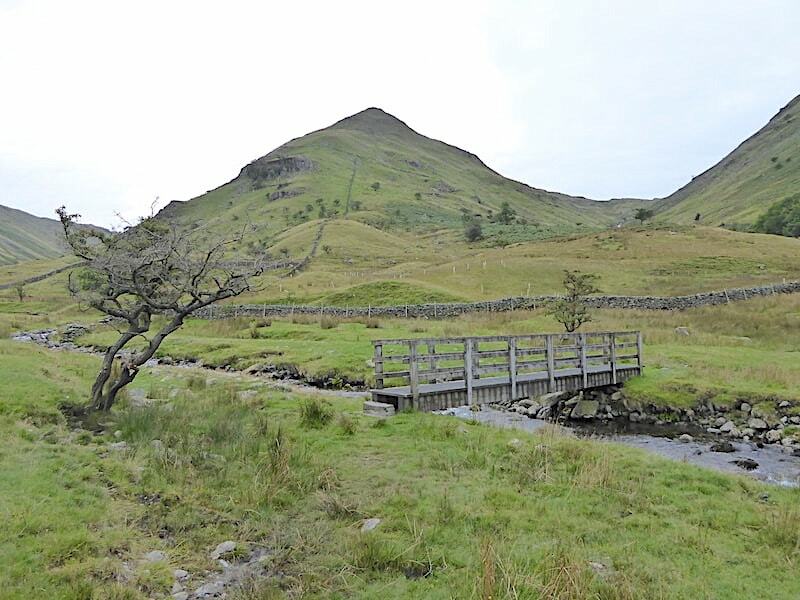 Passing through the gate we take a right turn alongside the wall to cross a smaller bridge and join the path coming up from Hartsop Hall on the west side of the beck. A look back along the path as J stops to remove his jacket, mine was removed some way back as it was starting to feel very muggy within the confines of the glen. 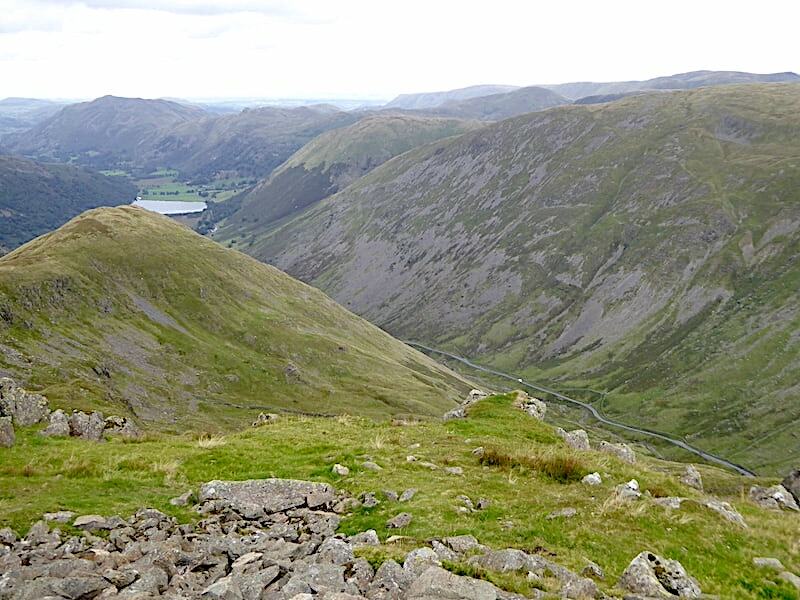 On the skyline are Place Fell, Angletarn Pikes, a section of Brock Crags with the great bulk of Hartsop Dodd over on the right. There’s no-one on the path and there wasn’t very much traffic on the Kirkstone Pass either, everything seemed eerily quiet for a mid-morning in the holiday season. 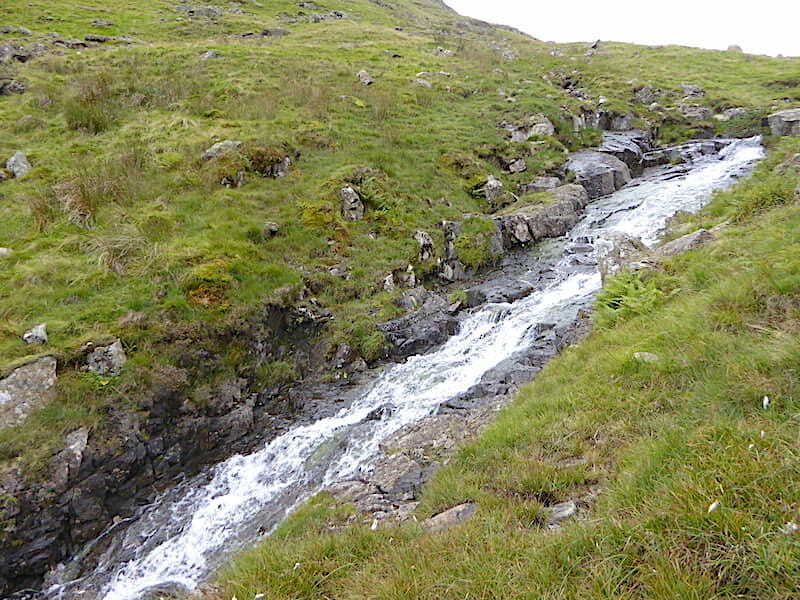 We continued on our way up Caiston Glen so here are a few shots of the various falls and slides in Caiston Beck for you to have a look at while we plod steadily upwards. 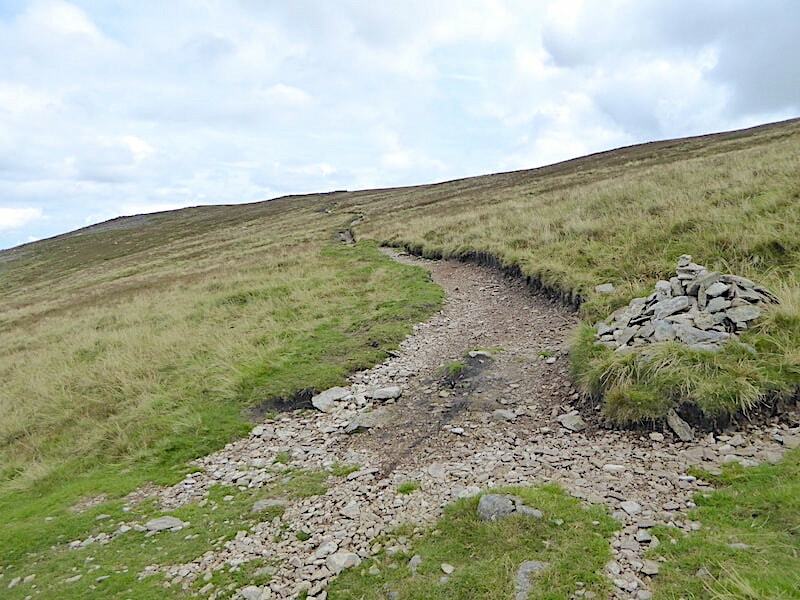 The walk up didn’t seem quite so steep today as it has done on previous walks, but on the other hand it did seem to be an awful lot further than I remembered …..
….. and although we can see the top of the pass, more or less, we still have quite a way to go before we reach it. 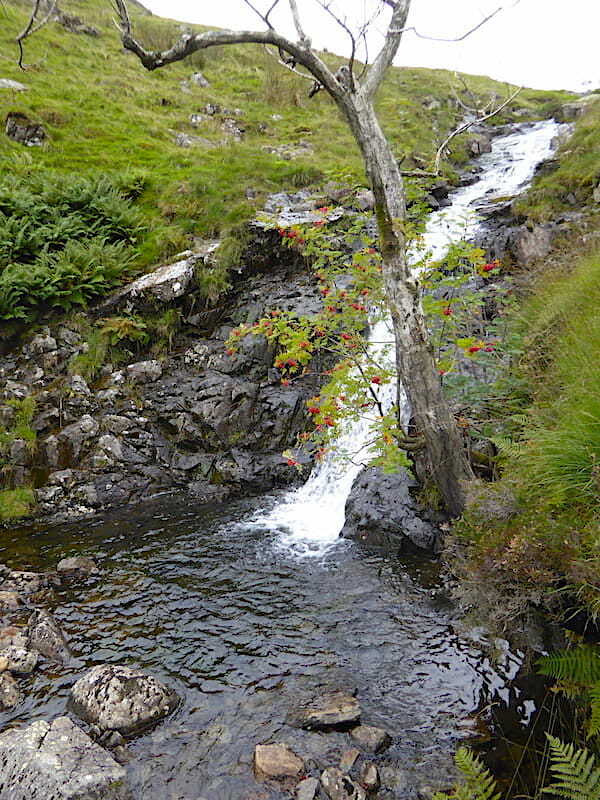 With a sore calf muscle I wasn’t looking forward to climbing up the glen but it didn’t give me too much trouble at all. The ground wasn’t very wet and muddy either so that helped a lot too. 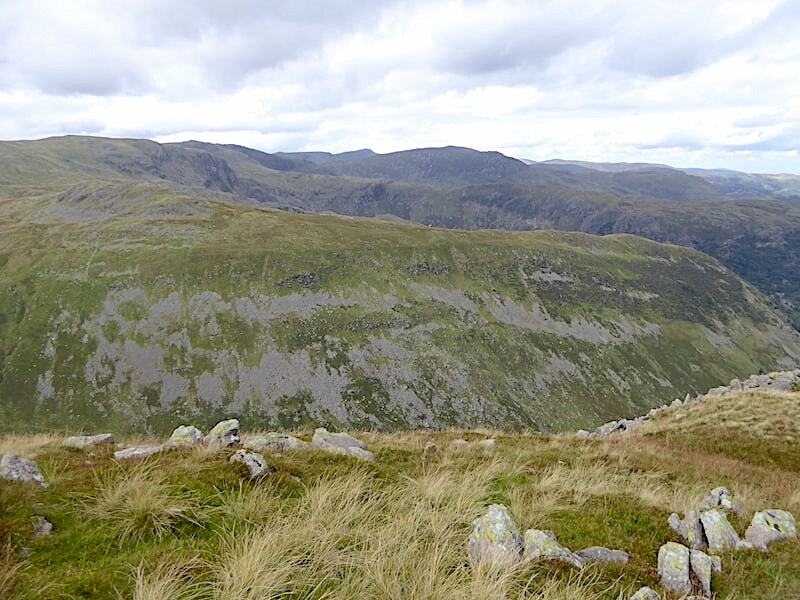 The end of the first section of the walk comes into sight as we reach the ladder stile at Scandale Pass above which, on the skyline, is ‘One of the easiest miles in Lakeland’, as described by AW, the mile long ridge route from Dove Crag down to High Pike. 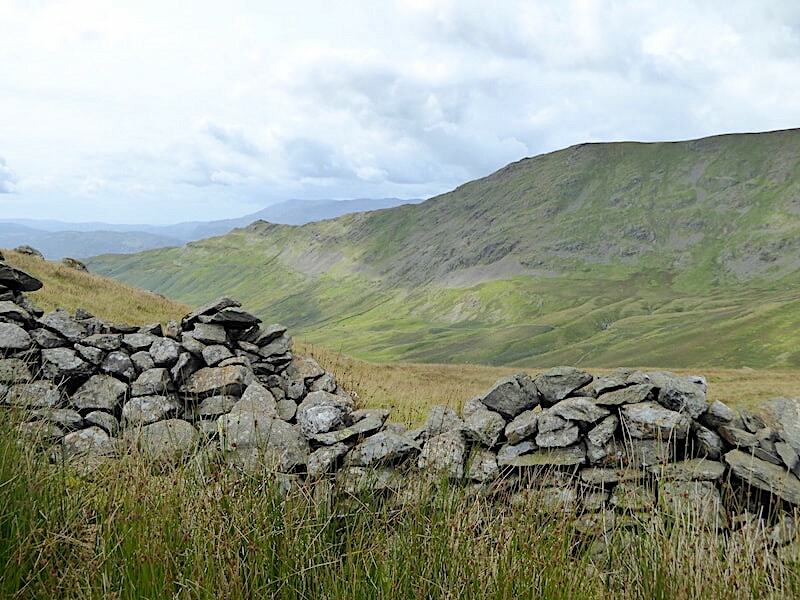 Looking beyond the ladder stile to Little Hart Crag. The sun snuck out from behind the clouds just as we arrived so we parked ourselves by the wall as J decided it would be a good place for his Mars Bar break. He hasn’t had a Mars Bar break for some time because he stopped bringing one during all the hot weather of May, June and part of July. Instead of a chocolate bar to bite into what he’d been unwrapping was more akin to a warm, and very messy, chocolate and toffee soup. With the cooler weather the bar remains intact and life returns to normal. 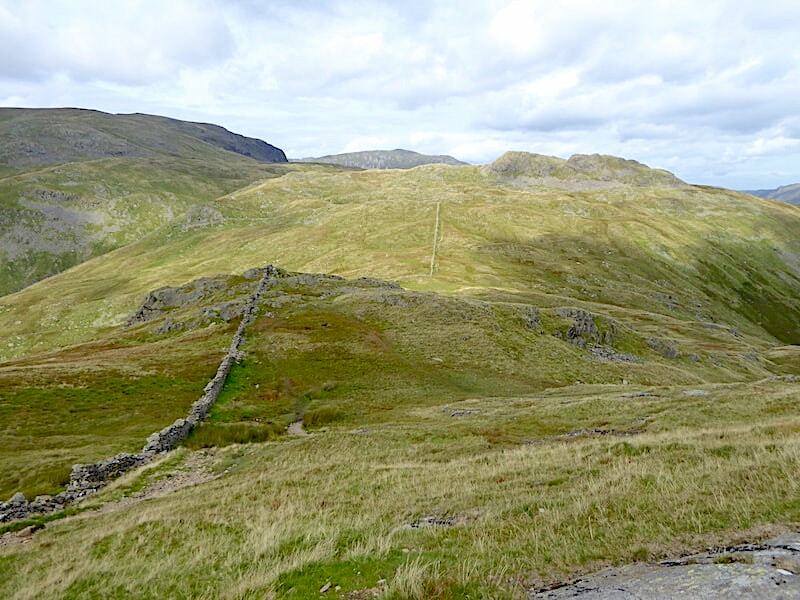 Mars Bar break over so we continue on up alongside the wall on the path up to Red Screes. 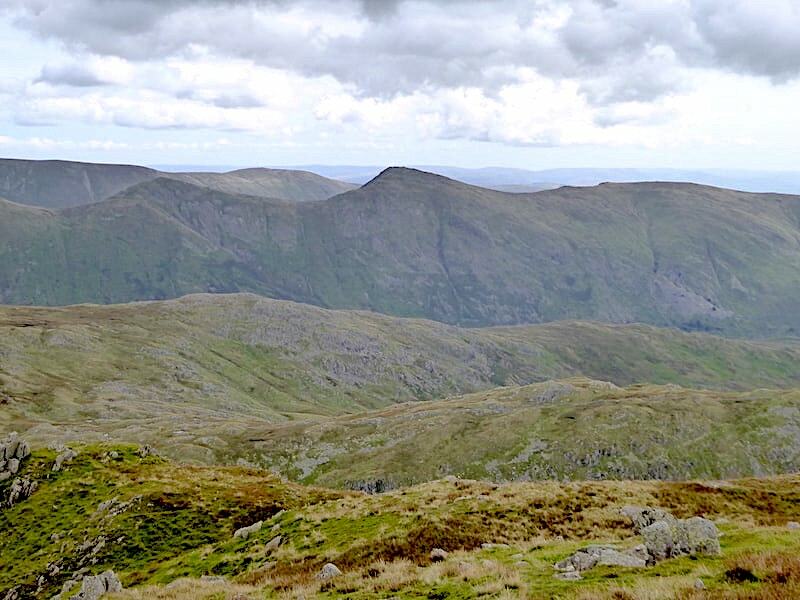 On the way I took a look across at the eastern arm of the Fairfield Horseshoe, where ‘the easiest mile in Lakeland’ over to High Pike ends and the somewhat rougher drop down, over several rocky sections, to Low Pike begins. 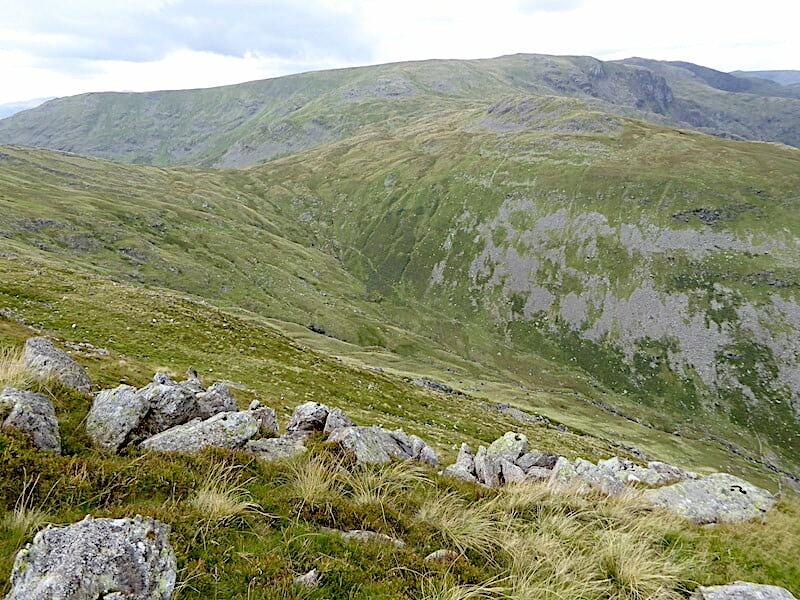 Further up the Red Screes path and a view down into Scandale with the Coniston fells beginning to put in an appearance above Low Pike. 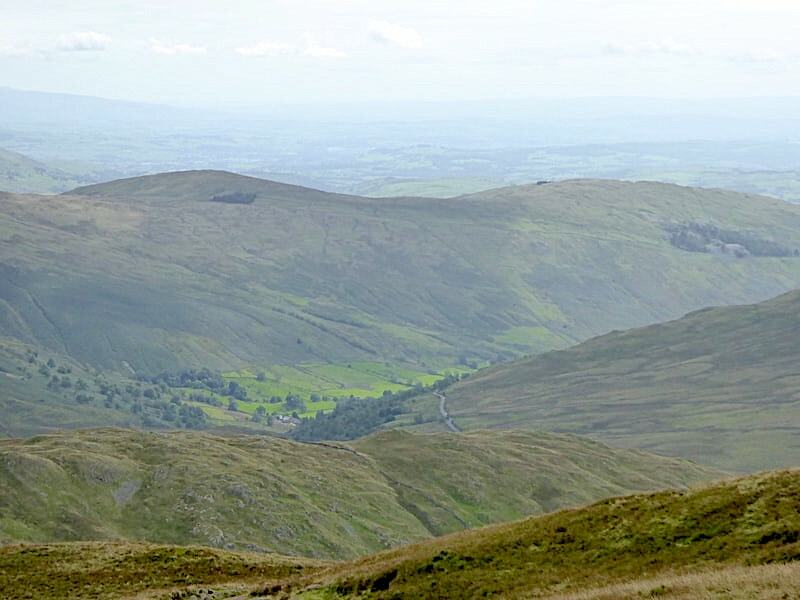 We met our first two walkers of the day coming down from Red Screes just about here and exchanged brief greetings with them. 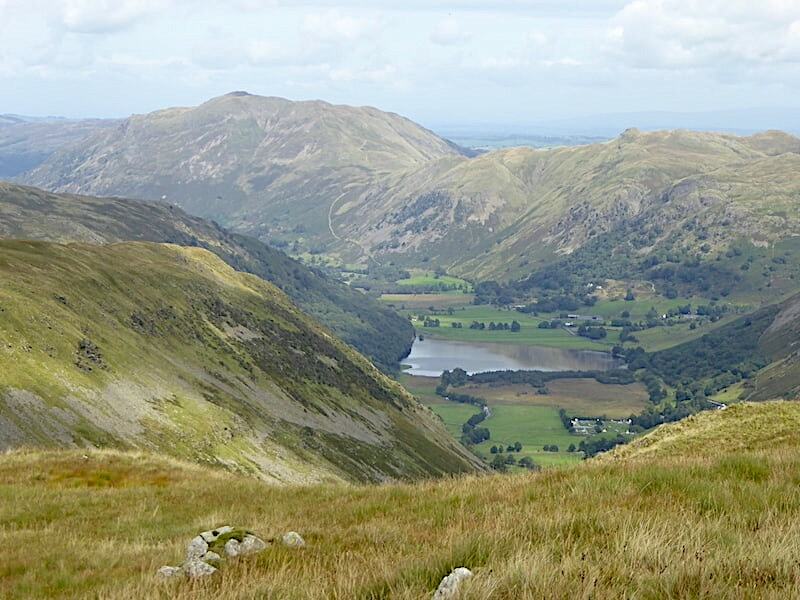 A look back down towards Patterdale as we carry on up the path. 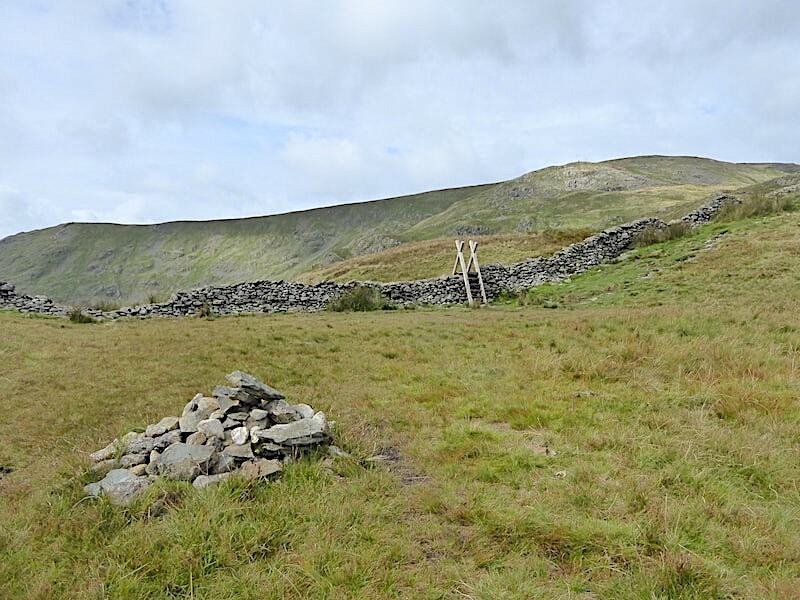 Some sunny patches are appearing and there isn’t a breath of wind so its ideal climbing weather. 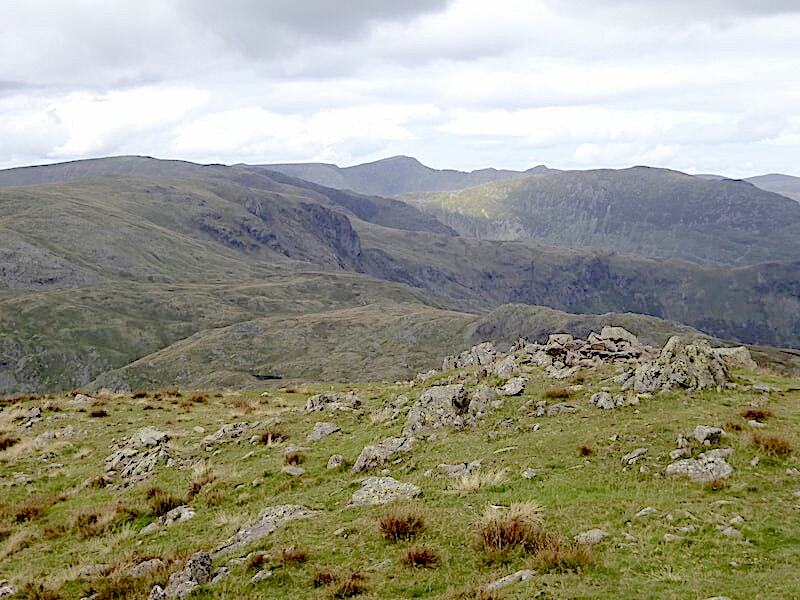 Looking back to Little Hart Crag, on the right, with Saint Sunday Crag just beginning to appear behind it and the dark brooding crags of Dove Crag on the left. 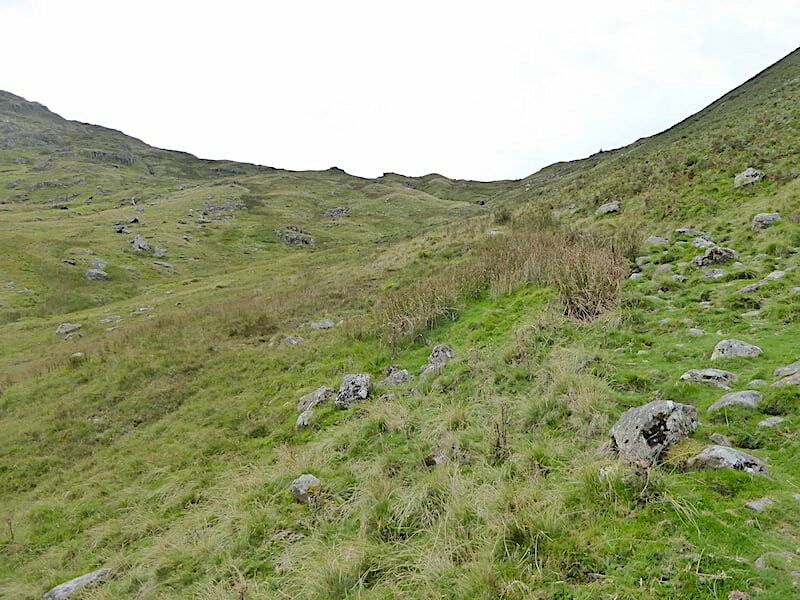 As can be seen this is quite a steep section so my sore calf muscle didn’t like it very much, walking poles came to the rescue on this section. 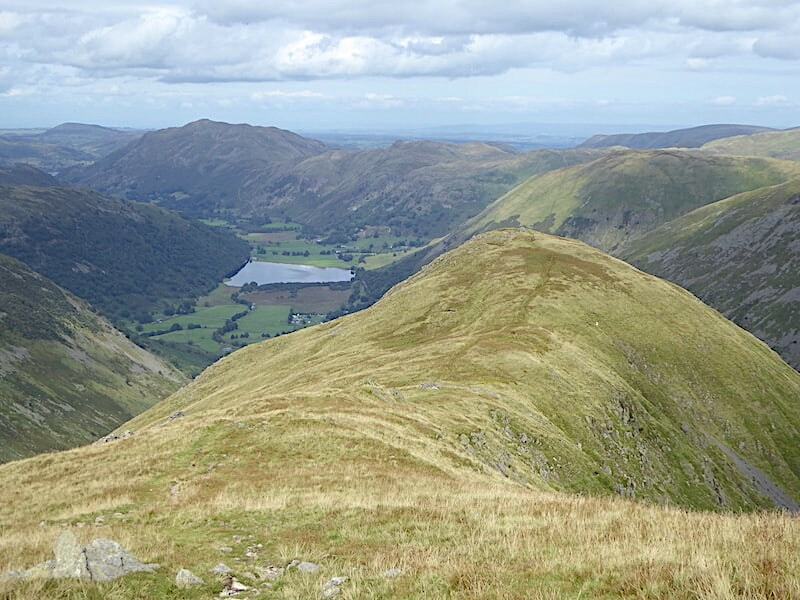 A lovely sunny view of Place Fell and Angletarn Pikes as I take a look back down along Brothers Water …..
….. and from the same spot a look over to our left to the top of Red Screes. 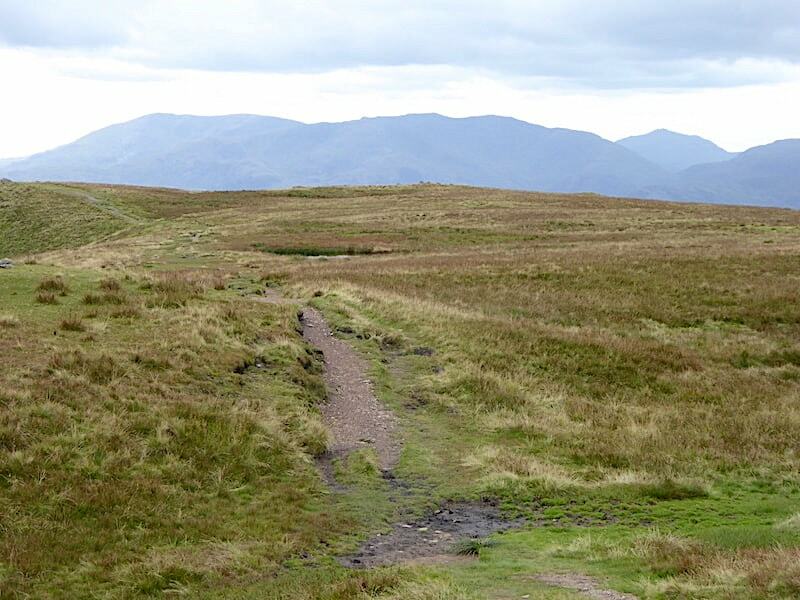 The path alongside the wall comes to this junction and here we follow the much easier traverse path over to the summit of Red Screes. 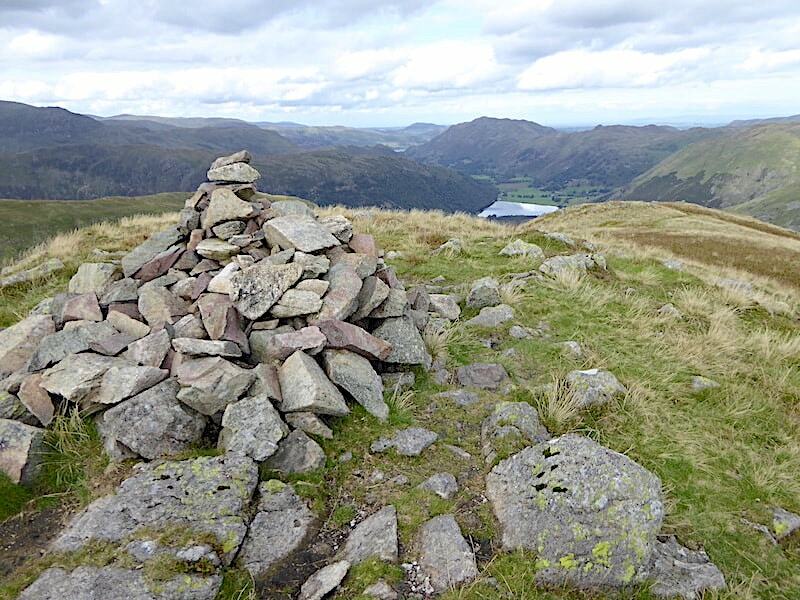 Its also possible to continue on up beside the wall eventually meeting up with the path coming up from Ambleside and approaching the summit from there. My sore muscle has had enough of ‘up’ for the time being so we take this gentler option to the top. 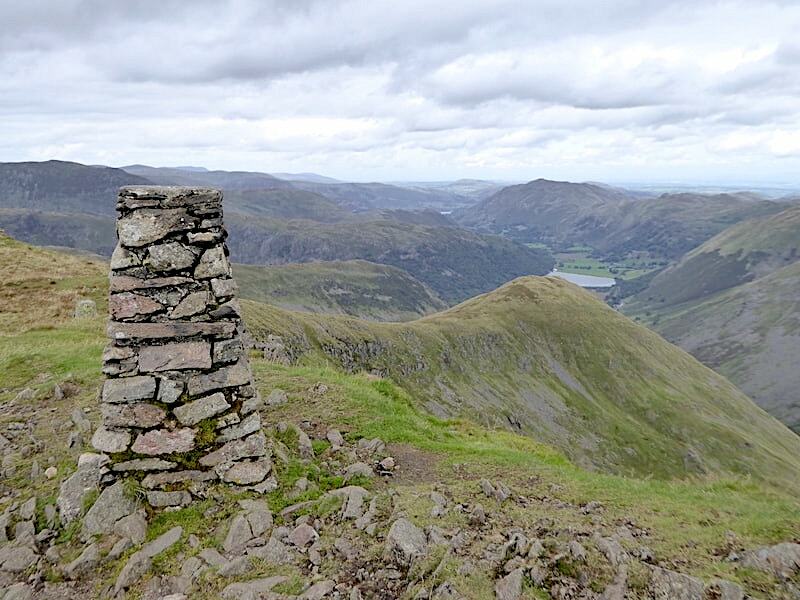 So, here we are at the trig column on Red Screes looking over Middle Dodd towards Brothers Water, and I think this is the first time we’ve stood here and not had some degree of air movement around us. 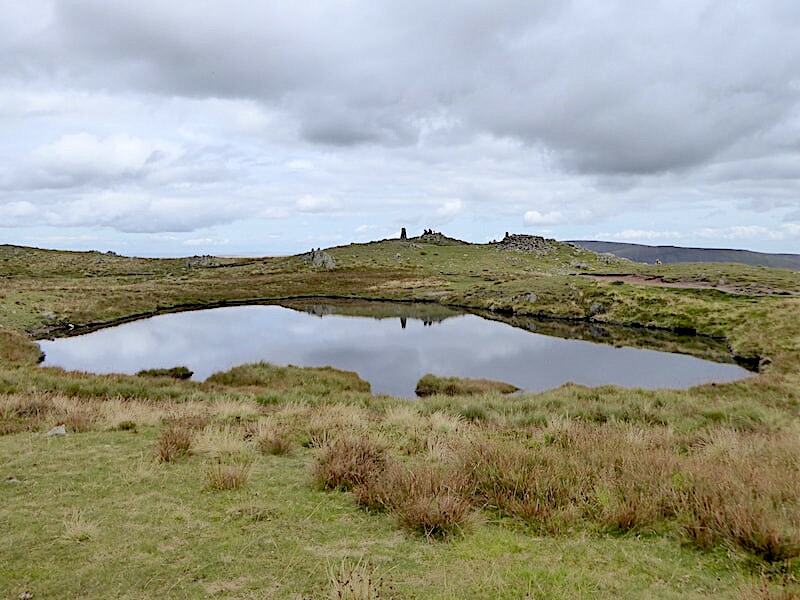 Today there was nothing and all was perfectly calm and still, very unusual and very acceptable too as its not the best place to be standing in a high wind. 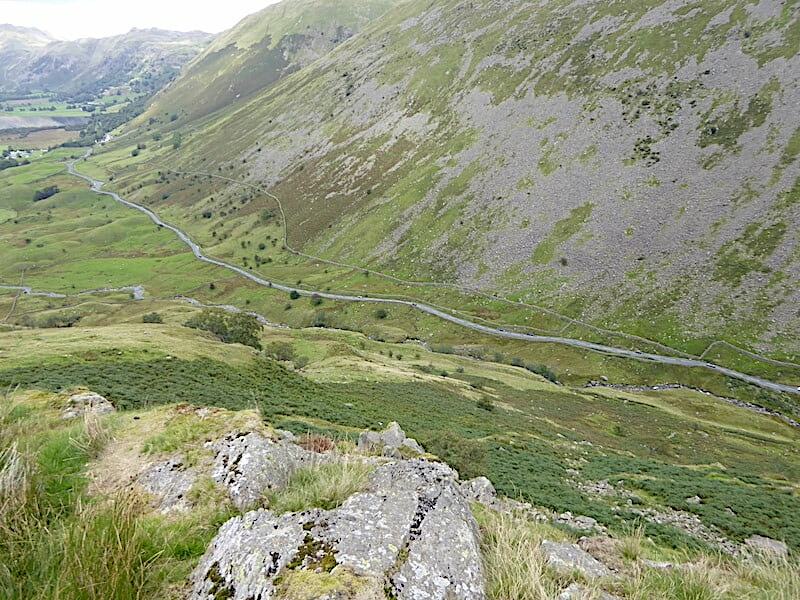 Its a long way down to the Kirkstone Pass, something in the region of a thousand feet. 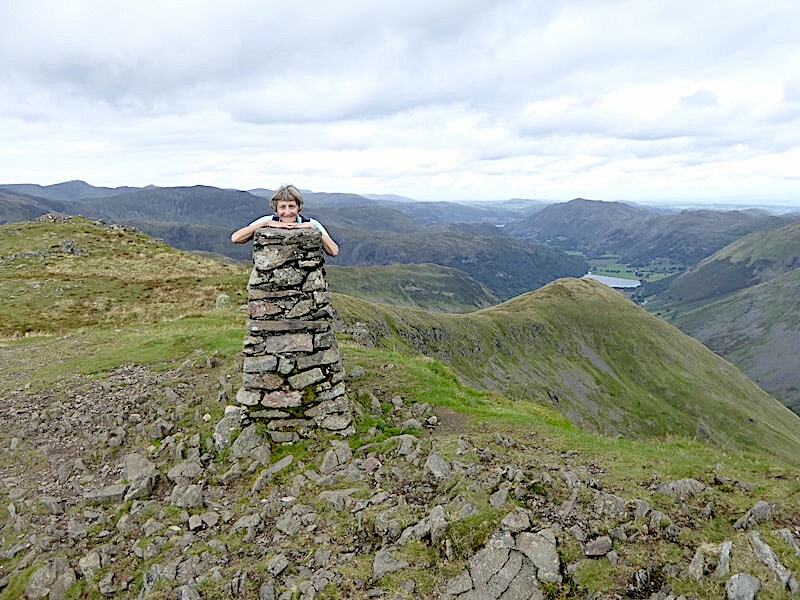 J taking in the views from the trig column …..
….. while I just turn myself into a stone Dalek and behave like a ten year old. 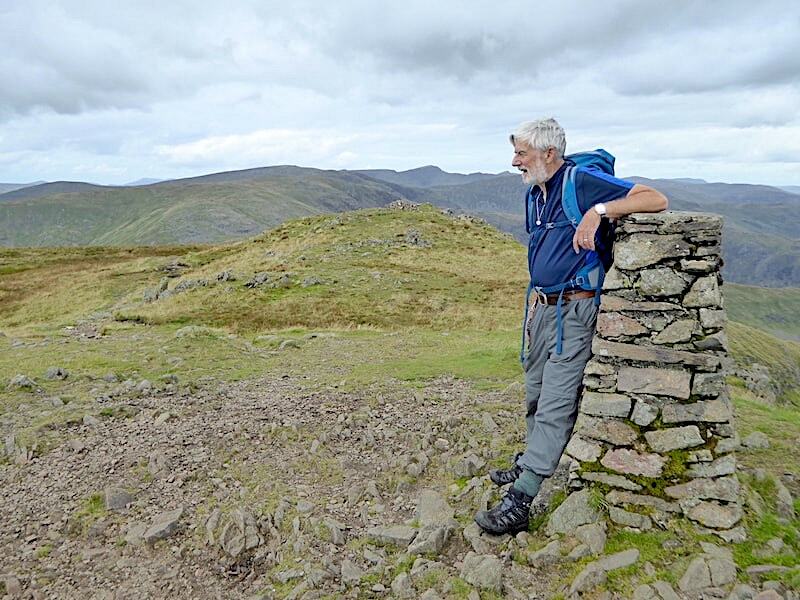 Moving quickly on …..
….. for a dizzying look down at the Kirkstone Pass, and a few views from the summit …..
….. to the east, across the Troutbeck Valley, are Sallows and Sour Howes …..
….. a little further to my left for a view of Froswick, Ill Bell and Yoke, with Harter Fell and Kentmere Pike just behind them on the left …..
….. above the huge bulk of Caudale Moor are Kidsty Pike on the left and High Street on the right …..
….. and from the summit shelter a view of the trig column and summit area. The shelter was empty, although there were a couple of groups sitting elsewhere, so we parked ourselves in it, got out the drinks and sandwiches and spent a very pleasant half hour eating and watching the antics of several walkers who arrived shortly after we had settled ourselves down. One such group was a dad accompanied by a daughter and son, I’m guessing late teens for the daughter, mid teens for the son. 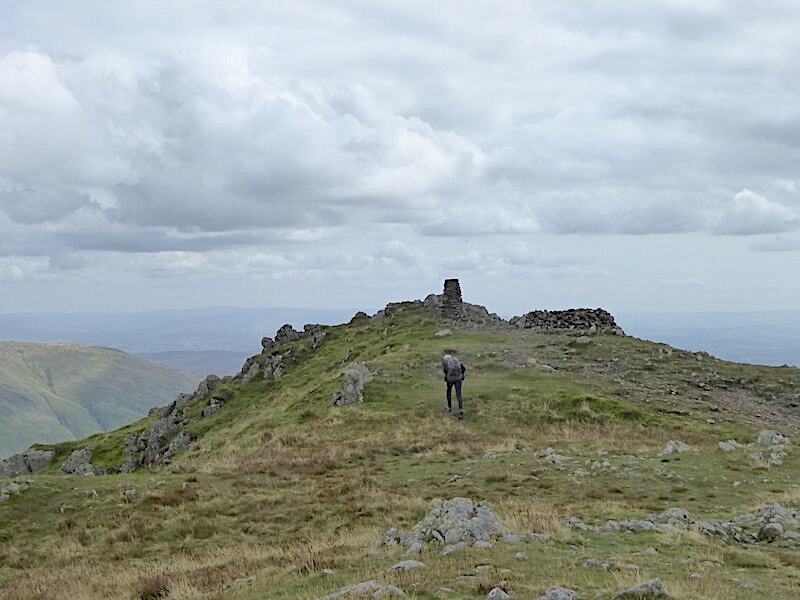 The lad was on his mobile talking to his mother telling her that they had reached the top, only for her to tell him that he had forgotten to take his sandwiches with him. He duly passed on this information to the other two and no doubt you can guess big sister’s reaction to the news. I don’t know if she or dad shared their lunch with him because they wandered out of sight to have their break, but I do know that big sister is unlikely to ever let him forget about it. If you’ve got a big sister or brother you’ll know what I mean. 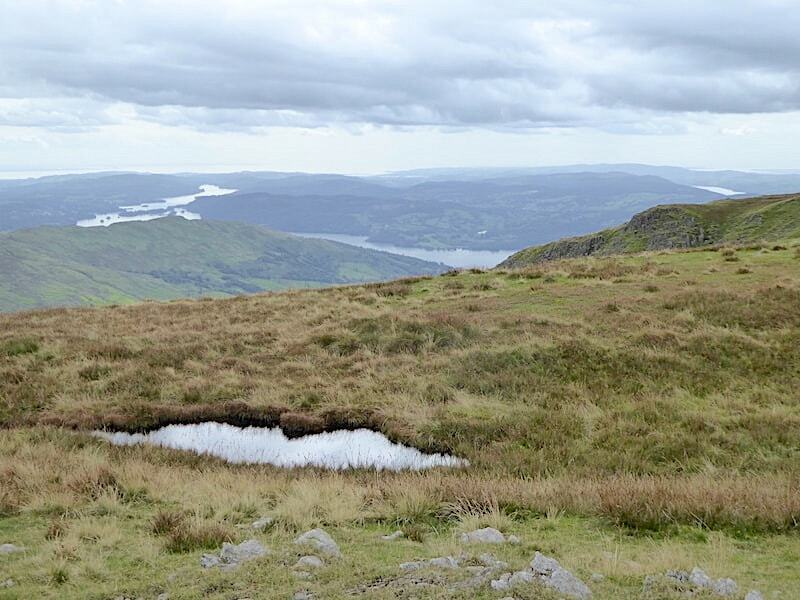 After our break we had a wander around the summit area for a few more shots of the views, this is the view south down to Windermere, with just a sliver of Coniston Water showing over on the right …..
….. to the south west are the Coniston fells and Harter Fell above the path down to Ambleside …..
….. Harter Fell again, over on the left, now with Crinkle Crags, Bowfell, the Scafells and Great End ranging along the skyline …..
….. due west of us for a close up of Great Gable and Pillar, eleven and a half and fourteen miles away respectively …..
….. and a little further along is the High Stile ridge on the left skyline, the next little pimple on the skyline is Dale Head in front of which is Great Rigg rising up to Fairfield, and between Great Rigg and Fairfield is Grasmoor in the far distance. 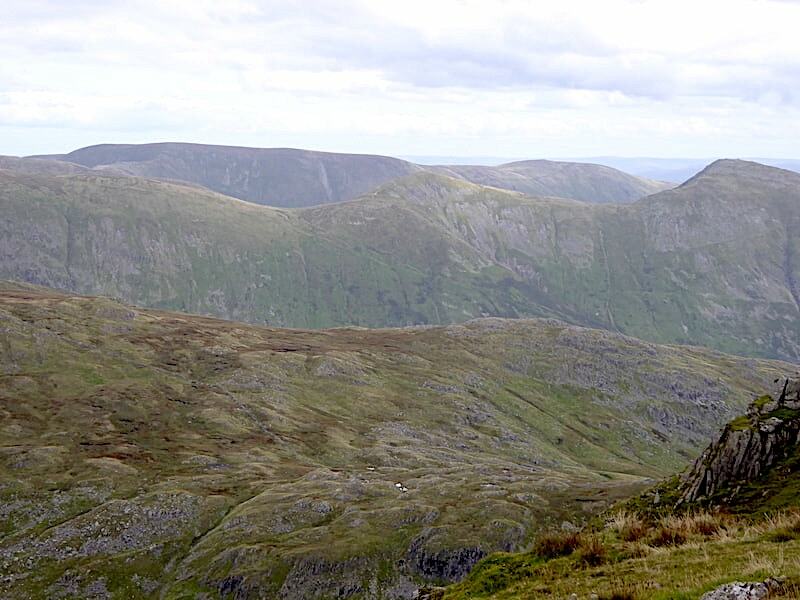 Looking to the north west where Saint Sunday Crag takes up most of the middle of the shot and behind it to the left are Helvellyn and Catstycam, with Great Dodd over on the far right. 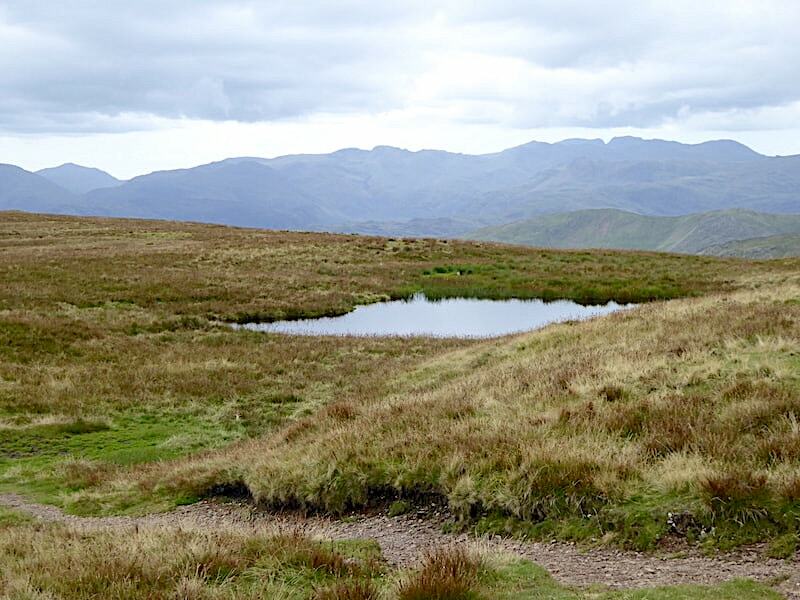 Red Screes summit area across the tarn where not a ripple breaks the mirror finish on the surface of the water. 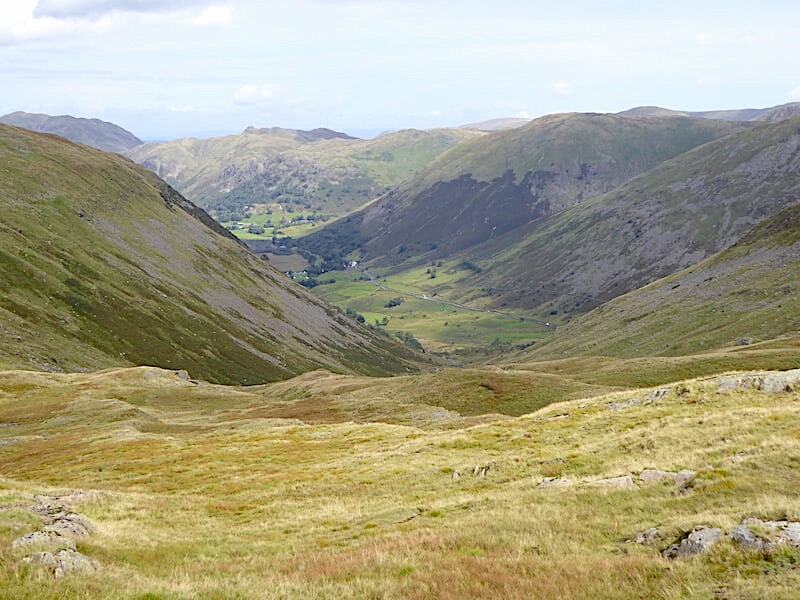 Looking east across the Kirkstone Pass and Caudale Moor with some of the far eastern fells on the skyline. 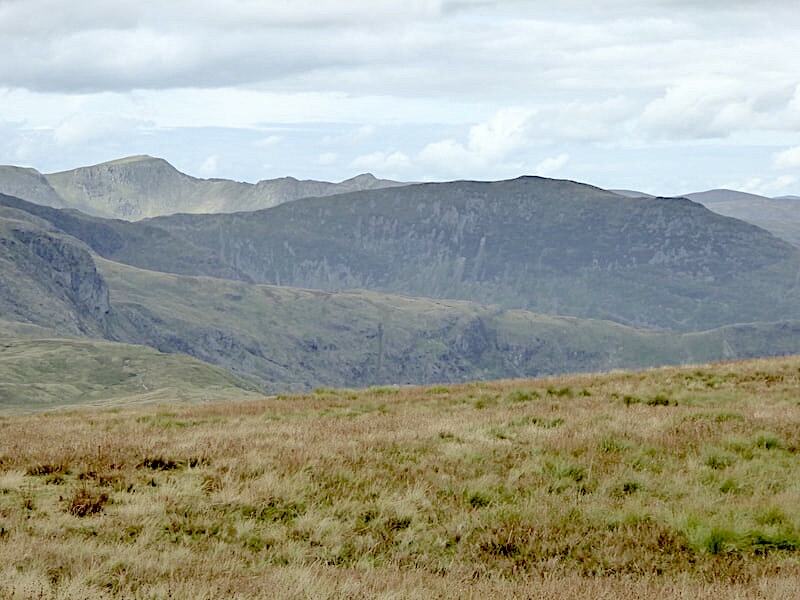 Layers of fells to the west of us too, the most prominent being Helvellyn on the centre skyline. 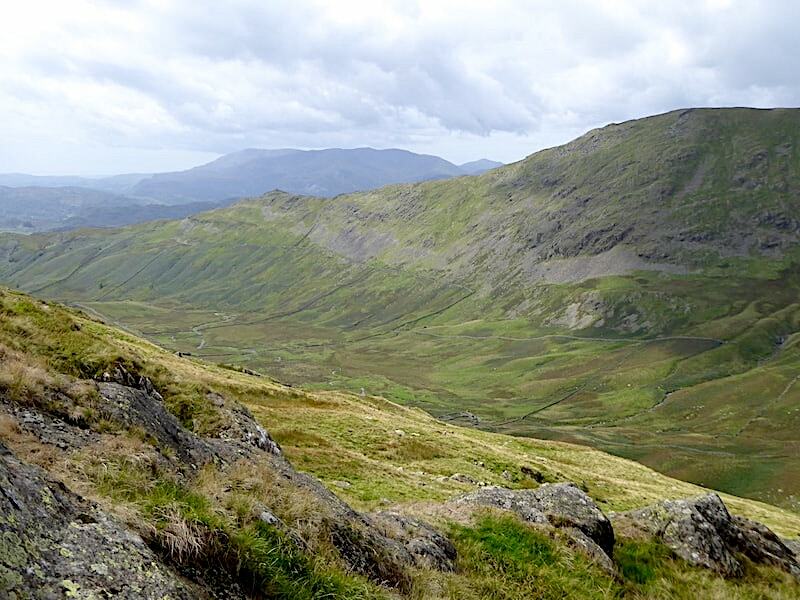 The view south eastwards now with Harter Fell and Kentmere Pike on the skyline, below them are Froswick and Ill Bell. 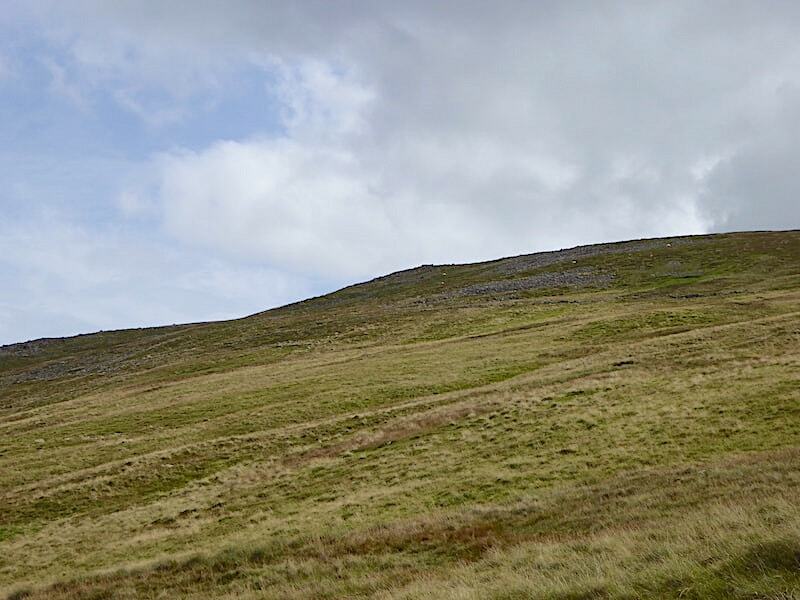 After a good look around we made to leave but the lone walker in the shot was just arriving and stopped for a chat. After thirty minutes of talking, mostly on his part, we extricated ourselves and managed to get under way again. While we were talking the lad who had left his sandwiches at home came charging along between us and the edge. He slipped and fell down three times in quick succession and I’m sure all three of us had our hearts in our mouths each time he did so. It was a miracle that he didn’t fall right over the edge the speed at which he was running. 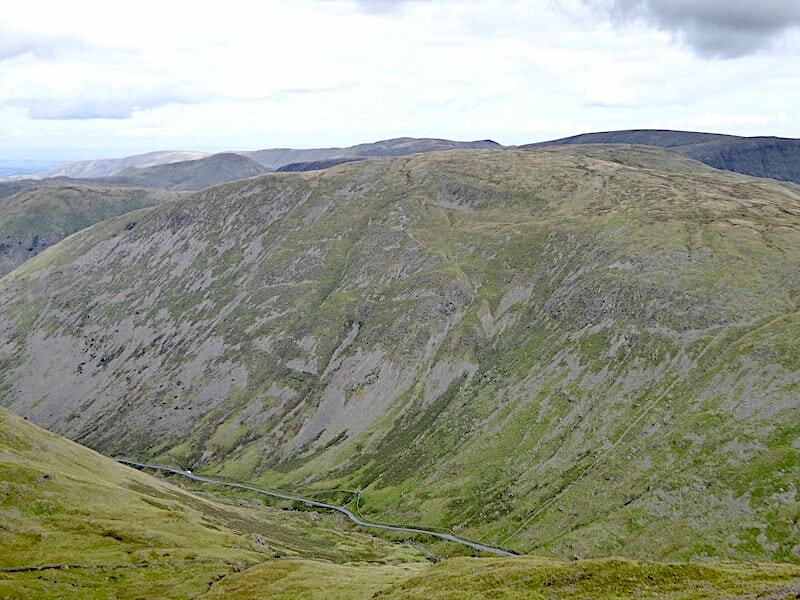 The view down to Middle Dodd as we began our descent …..
….. and a look back up at Red Screes as we made our way down. 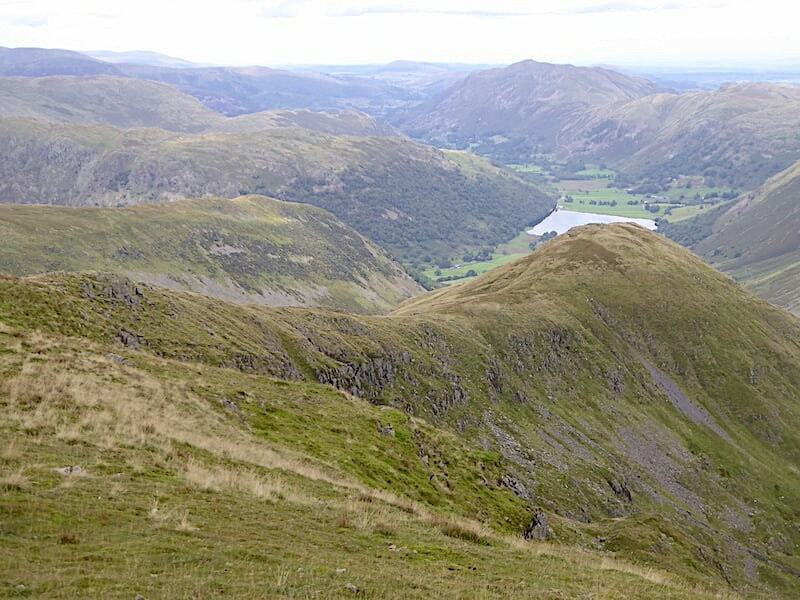 An enjoyable tramp along the grassy path across Middle Dodd and a grand view all the way along. 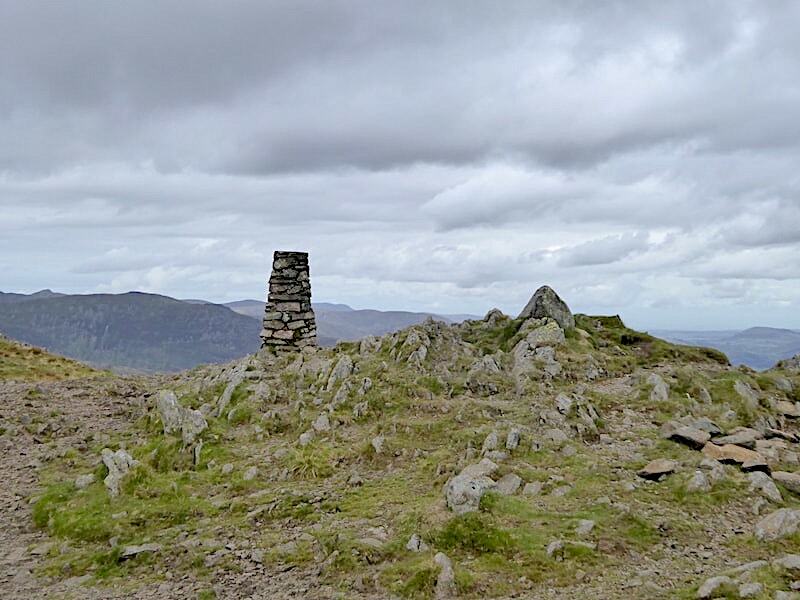 We met no-one anywhere along the way and before long we were approaching the summit of Middle Dodd. 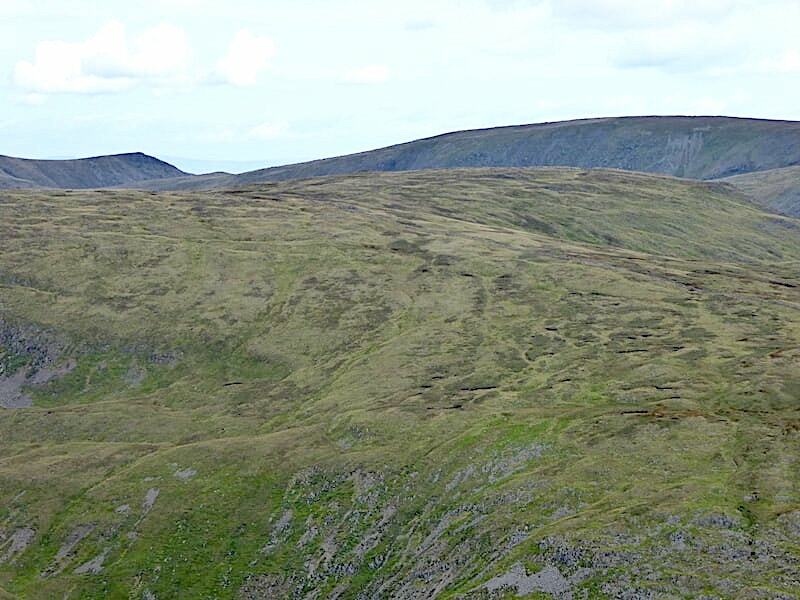 It looks as though we are about to fall over a precipice as the path disappears over one of the false tops. 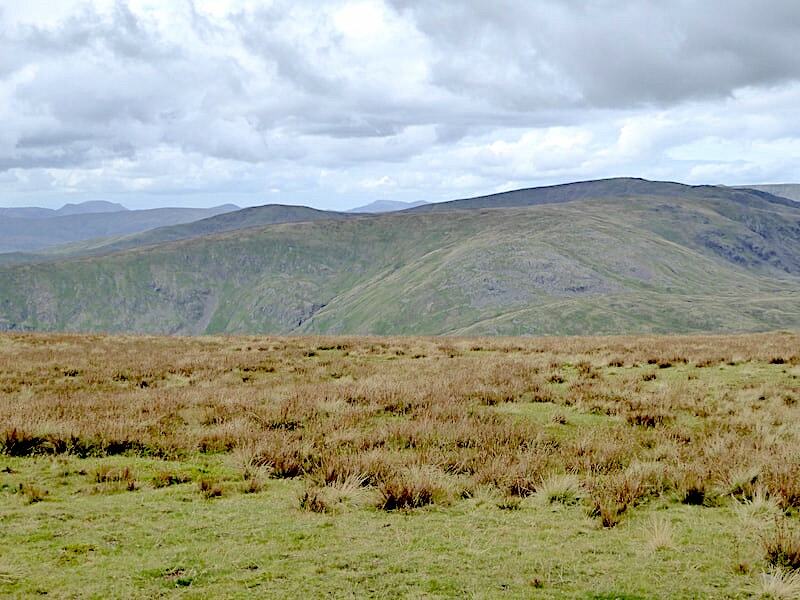 The views are extensive, behind Place Fell on the centre skyline is Great Mell Fell about ten miles away. 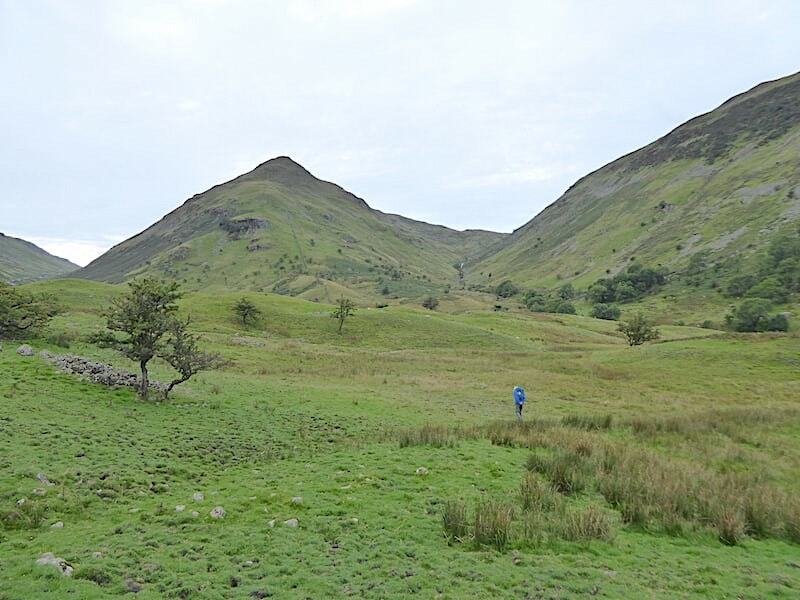 Immediately to the west of us is High Hartsop Dodd, behind which is the ridge of Hartsop above How leading up to Hart Crag. 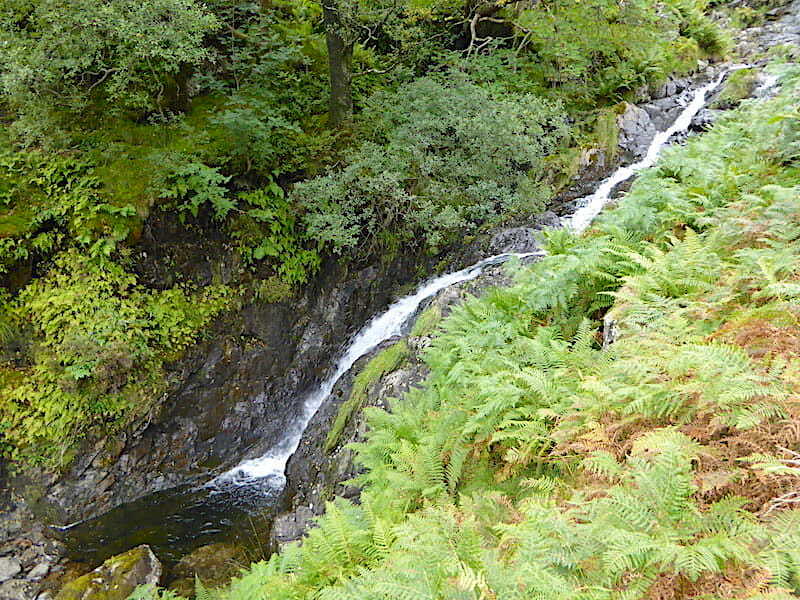 The view down into Caiston Glen which we followed on our outward leg. 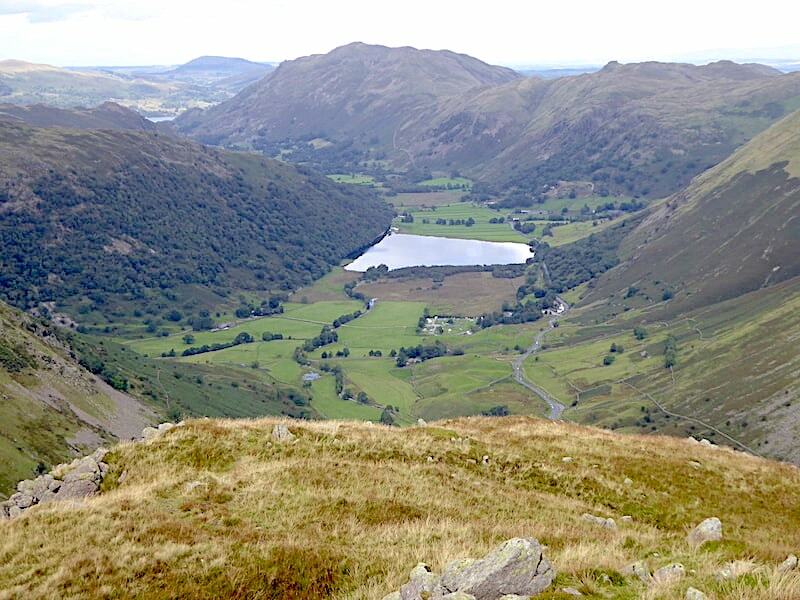 Just about here we lose the enjoyable grassy path and begin the steep, and at times rocky, descent back down to Patterdale. 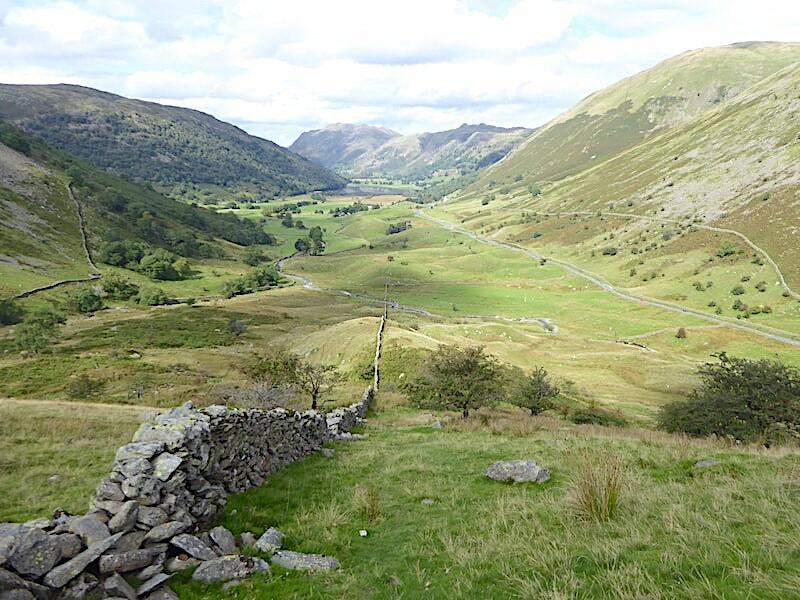 The heart stopping view down to the Kirkstone Pass. 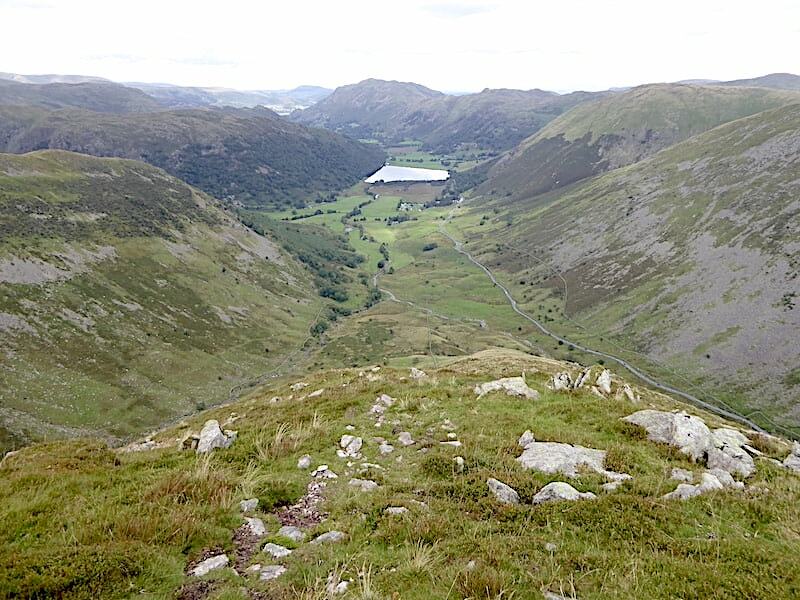 At this point the roughest part of the descent is just about over and done with and it was a great relief to be back onto an even grassy slope once again. 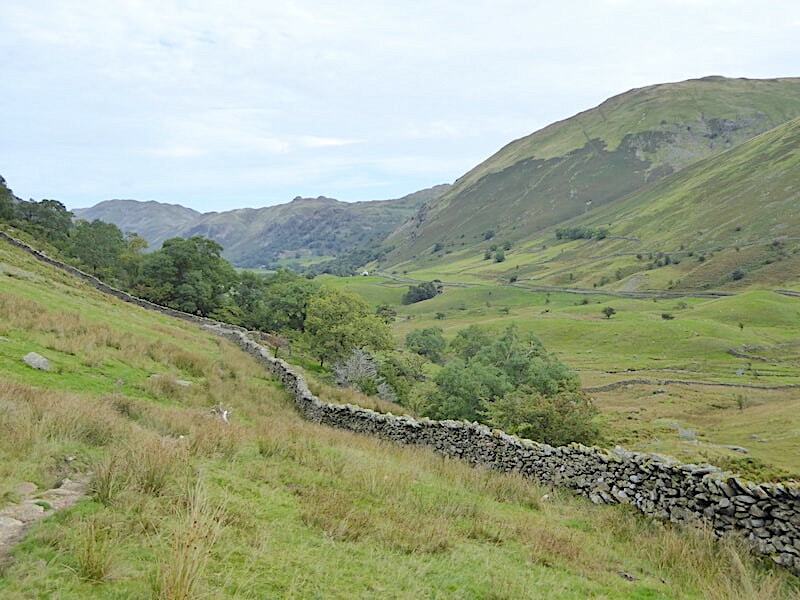 My sore and tender right calf muscle had taken a bit of a hammering during the walk/clamber down and by now was feeling a little bit sorry for itself so I treated it to a five minute rest while I enjoyed the view along the valley from a convenient flat stone on the wall. 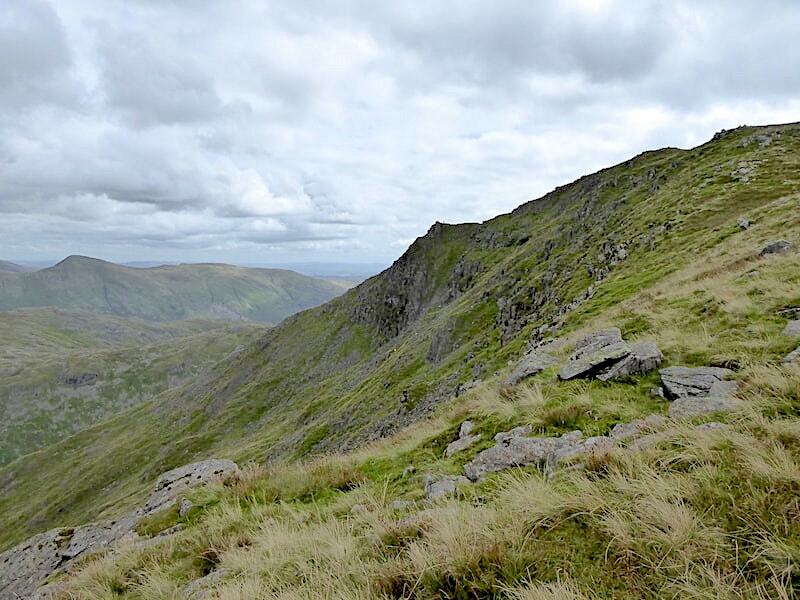 A look back up at Middle Dodd as we reach the luxury of flatter and more even ground. 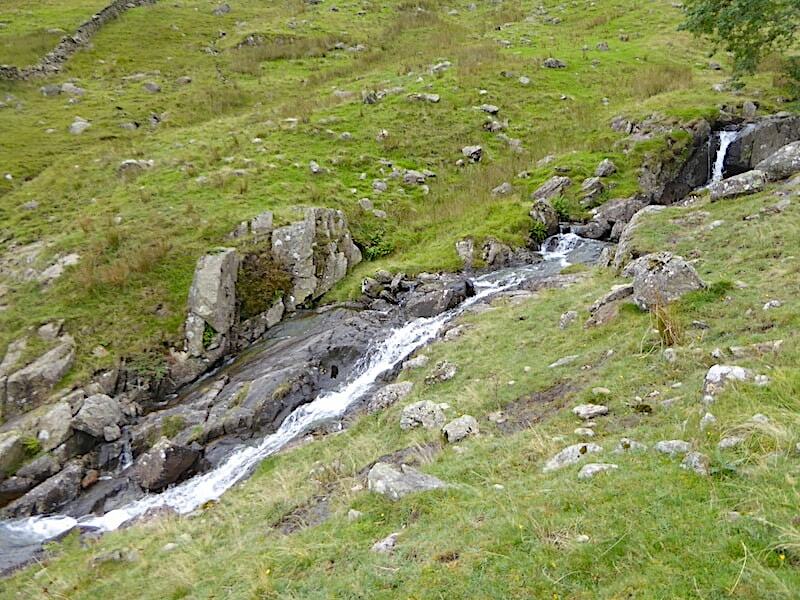 Back at the bridge over Caiston Beck now with a look up the Kirkstone Pass. From the bridge it was just a short walk over the grass back to the road and the lay-by where the car was parked. 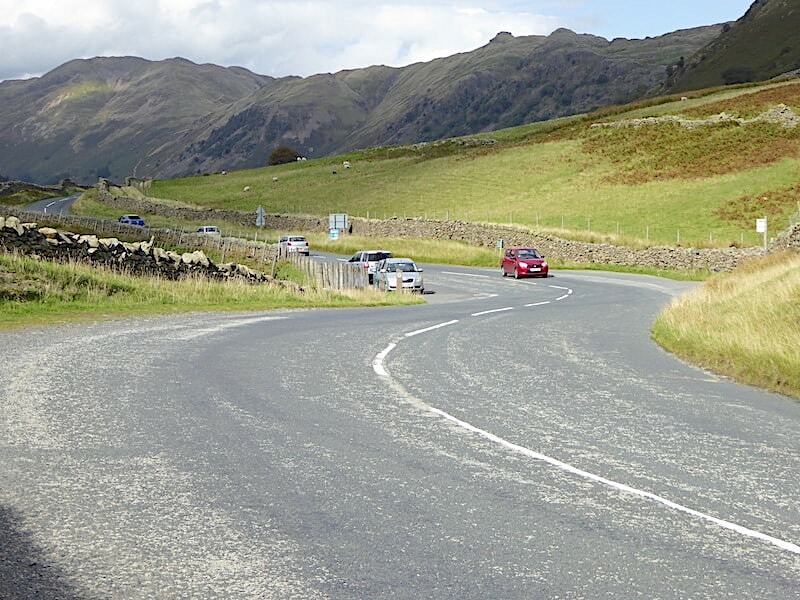 The afternoon had turned quite sunny and warm and the road was much busier than it was when we started out. I limp back to the car, thankful for a level surface under my feet once again, and flop into the car seat. Now, a day later and the calf muscle is still sore and tender so I must have had one heck of a cramp attack and I still can’t understand why it didn’t wake me up if was so severe. Perhaps I should just be grateful that I remained in the Land of Nod and never knew a thing about it until the following morning.